Welney is a large parish that lies on the county boundary with Cambridgeshire. The distinctive landscape of the Fens gives Welney its character. The name Welney first appears in the 14th century, and means ‘river called Welle’, which is the old name for the Old Croft River. The Old and New Bedford Rivers run through the middle of the parish, and the hamlets of Welney and Suspension Bridge lie on either side of the river banks. So far, no prehistoric flint artefacts have been recovered from the parish. The cropmarks of Bronze Age ring ditches (NHER 2477, 22133) have been identified by aerial photographs. A Bronze Age axehead was found in 1879 (NHER 4428), a dagger (NHER 4432) and a razor (NHER 4437) have been found in the parish. Several Roman settlement sites have been identified in the parish. The cropmarks and soilmarks of a settlement (NHER 4438) dating from between the 1st and the 4th centuries AD were first recorded in the early 1930s. An excavation in 1935 revealed the remains of two rectangular timber buildings and several human skeletons. Roman pottery, coins and other finds including a bracelet and a leather sandal have been recovered from the site. The site of a Roman settlement (NHER 4435) was excavated near the Old Croft River in 1948 and 1998 revealing evidence of dense settlement and salt production dating from the 3rd and 4th centuries. A third settlement and salt production site was excavated in 1998 (NHER 4437), and a large amount of Roman pottery was recovered from the site. The cropmarks of a possible Roman field system (NHER 2477) and enclosures (NHER 15806) are visible on aerial photographs, as well as the cropmarks of small circular features possibly dating to the Roman period (NHER 35499). It has been suggested that the features are the result of haystack construction. Several Roman artefacts were found in the parish during the 18th and 19th centuries. A Roman coin hoard was found in 1718 (NHER 4429), a hoard of pewter vessels in 1843 (NHER 4431), and four Roman pottery vessels (NHER 4430) in the 19th century. One contained a human cremation. A wonderful example of a Roman pewter dish or lanx (NHER 4432) has also been found. 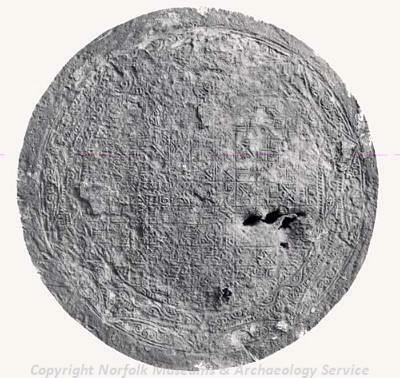 The dish has an inscription around the rim and a central circular panel filled with a chequerboard pattern. Fragments of Roman pottery (NHER 2508, 4433, 4434, 34561) and a coin (NHER 28066) have also been found. An Early Saxon girdle hanger (NHER 4437) and fragments of Early Saxon pottery (NHER 4439), a Late Saxon brooch (NHER 4437) and fragments of pottery (NHER 4434) have been found. The cropmarks of possible medieval fishponds which are thought locally to have been used for breeding eels (NHER 15760) are visible on aerial photographs, as well as the earthworks of a possible medieval field system (NHER 32120). Fragments of medieval pottery (NHER 4434, 23470) have been found. During the post medieval period the Fens were drained, creating the rich arable farmland that surrounds Welney. Wry Necked Mill (NHER 2503) is shown on Faden’s map of Norfolk, which was published in 1797. There is now no sign of the drainage pump on the site, where an early 19th century house now stands. Several other drainage mills (NHER 12853, 14503, 14512, 16181, 16192, 16194, 16195, 16196, 37173, 37172) are shown on historic maps of the parish. Copes Hill Farmhouse (NHER 33778) is an 18th century brick house with some 19th century remodelling. A complete Bellarmine containing animal bones was found underneath the dining room floor. 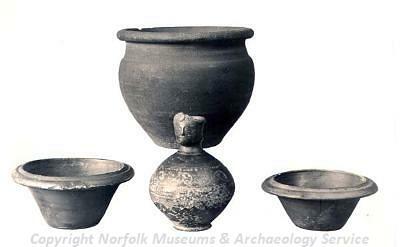 It is very rare to find ritual deposits in a house of this date, although such practices may have continued well into the 18th century in the Fens. St Mary’s Church (NHER 4441) was built in 1848 by J.C. Buckler in the Early English style. The church has a continuous nave and chancel with an arched west door and a gabled bellcote. The windows are a mixture of plate tracery and lancets. The interior contains a late 19th century stone reredos and stained glass by T. Wilshurst. A suspension bridge (NHER 4440) was erected in 1826 to a design by Captain Sir Samuel Brown and at a cost of £3000. 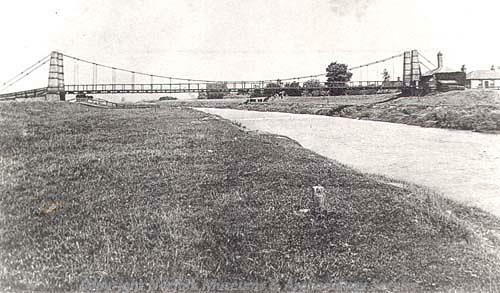 The bridge had a central carriageway with a footpath on either side. By 1925 the bridge had become too dangerous for use and in 1926 it was replaced with a concrete bridge with a central concrete arch. In 1996 this bridge was replaced by a modern steel and reinforced concrete structure. The original bridge gave the hamlet of Suspension Bridge its name. Sarah Spooner (NLA), 12 September 2006.